By Alan Alexander, M.D., M.Sc., Lena Naffaa, M.D. A 7-year-old girl presented for a low dose noncontrast computed tomography (CT) of the paranasal sinuses for chronic cough. During immediate review of the images, there was a partially visualized ovoid, high attenuation, apparent mass in the left buccal soft tissues adjacent to the mandibular body (A). After discussion with the patient and parent, a repeat CT with intravenous contrast was recommended and obtained. The repeat scan failed to demonstrate a lesion at the region of interest (B). The technologist noted that the child had expelled an object from her mouth into the trash can between the 2 studies. Further discussions revealed that the patient had a cough drop in her mouth to prevent coughing during the initial scan and subsequently discarded it. The cough drop was retrieved, placed in a cup of water, and CT images were obtained, demonstrating a high-attenuating ovoid object, identical to the “mass” initially seen (C). Reginelli A, Santagata M, Urraro F, et al. Foreign bodies in the maxillofacial region: assessment with multidetector computed tomography. Semin Ultrasound CT MR 2015;36(1):2-7. McDermott M, Branstetter BF, Escott EJ. What’s in your mouth? 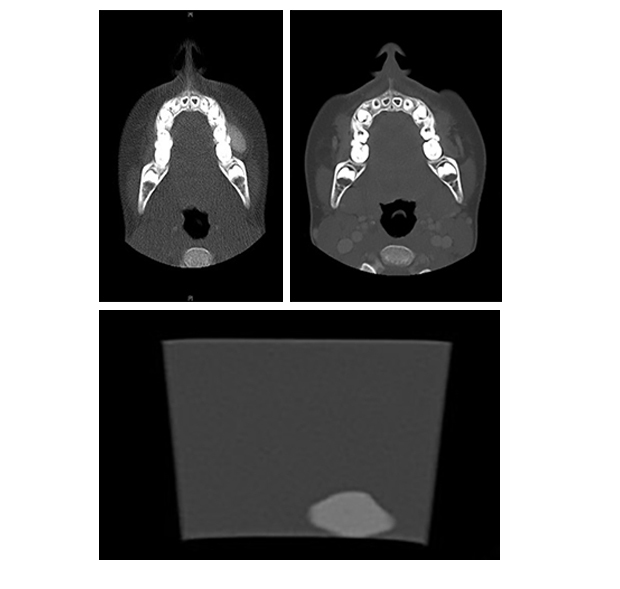 The CT appearance of comestible intraoral foreign bodies. Am J Neuroradiol 2008;29(8):1552-1555. Alexander A, Naffaa L. At the Viewbox: Foreign Body Masquerading as a Lesion in the Mouth. J Am Osteopath Coll Radiol. 2016;5(1):31. Alan Alexander, M.D., M.Sc., Lena Naffaa, M.D. Dr. Alexander is with the Aultman/Mercy/NEOMED Radiology Residency Program, Canton, OH and Dr. Naffaa works with the Department of Radiology, Akron Children’s Hospital, Akron, OH.